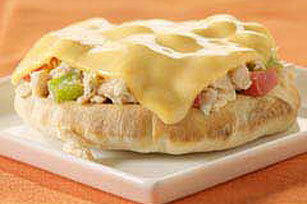 Canned tuna and garden veggies make terrific toppings for open-face sandwiches made with mini pita breads. Bonus: It's a Healthy Living recipe! Mix tuna, peppers, tomatoes, onions, dressing and oregano. Place pitas on baking sheet; top with tuna mixture and 2% Milk Singles. Broil 1 to 2 min. or until Singles are melted. Prepare using KRAFT 2% Milk Sharp Cheddar Singles and/or substituting KRAFT Light Mayo Reduced Fat Mayonnaise for the MIRACLE WHIP.